Please note: A security fee of $100 will be added to the cost of standard Individual, Couple, and Family memberships. Please note: As a Neshama Sustainer, whether you choose individual, couple, or family, you are still entitled to a total of 6 High Holy Day Tickets (up to 2 adults and up to 4 children). How did you find out about Romemu? What are some of your passions / hobbies / interests/ skills? These special memberships are for Romemu members age 22-34. Please confirm that at least one member of your household fulfills this criteria. Please upload a clear picture of a driver's license or other identification that contains date of birth. Student members must be enrolled in a full-time program for at least 6 months following the start of their membership. Please confirm that you fulfill these criteria. Please upload a clear picture of your student ID, including the expiration date. Student IDs must expire no sooner than 6 months following the start of their Romemu membership. Please indicate if you intend to use the High Holy Day tickets that come with your membership. Please note: Guest/ additional tickets will be available for purchase this summer. Please select one or both options. Please check here if you would like to provide yartzheit dates for remembrance as part of Romemu's yearly yartzheit calendar. If you have more yartzheits than this form allows, please contact Miriam Rubin, Director of Membership, at miriam@romemu.org. I/ we agree to uphold the Romemu community standards. The Romemu Membership Directory is a digital list of all our members, created to help members connect with one another. ​All members who join or renew for 2018-19 will be included in the directory unless they opt out by clicking the box below. Members will all receive an email providing​ personalized login credentials and are able to access their own profile in the directory, update their contact information at any time, and choose what contact information is shared. All members (whether they choose to include their own information or not) receive access to the Romemu Membership Directory. Members are asked to agree to use the directory only for community contact purposes, and may never be used for any professional, business, or other commercial purpose. The directory may not be released to any individual or group outside of Romemu. All new and renewing members are automatically subscribed to the Romemu newsletter and general publications. Please indicate below what other communication lists you'd like to be added to. You have the option to pay for your Romemu membership by either credit card or check. Both options can be paid in monthly installments or in one payment for the year. Payments by credit card: Yearly credit card payments carry the option for automatic renewal, while all monthly credit card payments will automatically be renewed for the future membership cycles. All credit card transactions will include a 3.5% processing fee. Payments by check: Please note that your membership is not active until Romemu receives your payment. Monthly check payments are due to the Romemu office no later than the 15th of the current month (i.e. July membership dues must be paid by July 15). Memberships paid by check will not be automatically renewed for future membership cycles. Please note: Automatically renewing memberships will be updated and charged at the rate of each new yearly membership cycle. An email reminder will be sent before the start of each cycle to alert members to any changes in membership rates. Thank you very much for filling out the 2018-2019 Romemu membership form. We are so appreciative of your time and your commitment to this community. 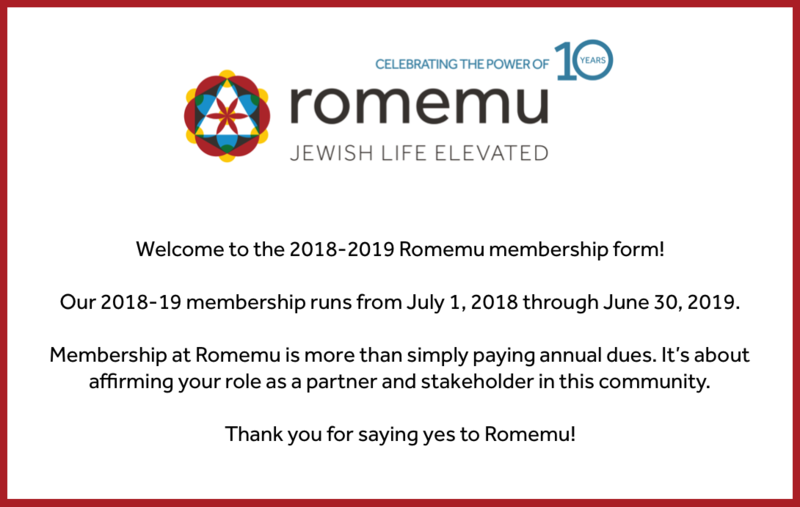 If you have any further questions about your membership or about Romemu in general, please contact Miriam Rubin, Director of Membership, at miriam@romemu.org.